...was born in Zambia and grew up in South Africa. She did her BSc (hons) in zoology at the University of Bristol (UK). She started her PhD titled: 'the distribution, ecology and conservation of cave-dwelling bats' in 2010 being supervised by Dr Kirsty Park (University of Stirling, UK) and Professor Gareth Jones (University of Bristol). Rachael is passionate about wildlife conservation and hopes to contribute towards the conservation of African bats through her research and working on various Bats without Borders projects. ...is our ‘bush craft engineer’, avid photographer and braai (bbq) master. Keith took two sabbaticals from his ‘real’ job as an aeronautical engineer to volunteer on two different community development projects, initially in South Africa (for a NGO called Masicorp, which he is still involved with) and then in Botswana, for the Rothschild Foundation. During this time Keith also volunteered lots of his time helping with Rachael's fieldwork - either crawling through caves, catching bats or doing driven transects and most of the photos on this website are thanks to him. From his time in Africa Keith decided to change his career and completed a Masters in 'Africa and International Development' in September 2013 and continues to volunteer for Bats without Borders. 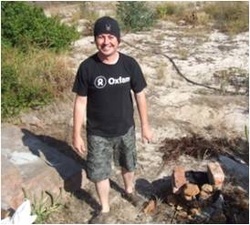 ...is an experienced conservation scientist based in Etosha NP at the Okaukuejo Research Centre, specialising in small mammals and fire risk assessment. He completed his BSc at the Nelson Mandela Metropolitan University (South Africa) and his MSc at the University of KwaZulu-Natal (South Africa). 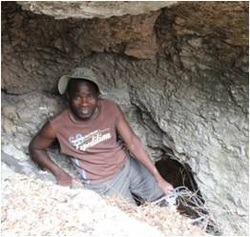 Marthin was the lead Namibian collaborator for Rachael's cave-dwelling bat project, helping with all in-country support. He also came along to help out with fieldwork, and engaged with community conservancies to help us to identify little known cave and sink holes in remote areas. Marthin is our very own Jack Bauer, he can get anything sorted and often it does not even take 24 hours! From the moment Marthin released his first bat, his interest in bats has continues to grow. Marthin is now an Advisory Board member (Conservation Advocacy and Public Engagement and Education) helping to promote a positive image of bats in Namibia. ...is a true bat advocate and incredibly passionate about bat conservation both in the UK and southern Africa. 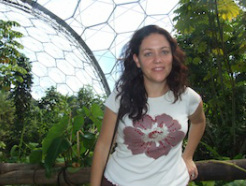 Sandie has been involved since the inception of Rachael’s PhD and joined her in Namibia to help with fieldwork in 2011. Sandie did her PhD in South Africa on fruit bats through the University of KwaZulu Natal, supervised by Professor John Hanks and now works as an ecological consultant and trainer (see www.anabattraining.com for more information). Sandie has extensive experience, including being a teacher (both in UK and SA) and we are delighted to have her as an Advisory Board member for Applied Research and Capacity Building. ...worked as an engineer 'in a former life' and has over 20 years experience working with bats in the UK and over 7 years in SA. He undertakes bat and other ecological surveys for ecological consultants in the UK (holding an England and Welsh bat license) and assists with training courses relevant to bats both in the UK and SA. These courses include: mist netting, harp trapping,bat handling, using Anabats, analysing bat calls in AnalookW and in the UK Bat Licence Training. Gerry (along with Sandie) volunteered to help Rachael with fieldwork in Namibia in 2011 - it was like having our very own Q from the James Bond movies - sorting out gadgets and inventing new ones! Gerry also undertakes repairs to ecological kit, (trading as GEM Repairs in UK), including Bat detectors (Anabat and others), sound recorders, lamps, and battery replacements. …has been studying bats for more years than he likes to admit. After a schoolteaching career he became a full-time bat consultant in 2005 and started Auritus Wildlife Consultancy - specialising in bat surveys and mitigation. He also works as a part-time advisor and trainer with Scottish Natural Heritage, the Bat Conservation Trust and The Mammal Society in the UK. John brought his considerable knowledge (and Scottish wit) to help with the Botswana fieldwork! This certainly made sure our hours of driven transects were never boring. Out of many favourite memories, he liked hearing hippos grunt; watching elephants shaking trees for food; and avoiding suicidal giant millipedes on the roads." John is now one of our an Advisory Board members for Training and Capacity Building. …off-roader extraordinaire Stuart is not afraid to get his feet wet. He has worked in conservation for over 20 years as an ecologist and now runs his own consultancy – Stuart Spray Wildlife Consultancy. Although Stuart specialises in bats, he is an all-round ecologist with experience of surveying and monitoring a wide variety of protected species including other mammals, raptors and other birds, amphibians, and reptiles. While helping on the Botswana leg Stuart demonstrated these broad skills by finding a black mamba in our garden in Maun. Showing their passion for bat conservation Stuart and John have volunteered on numerous of bat projects both in the UK (radiotracking Leisler's bats) and abroad (e.g. Mexico and Poland) before coming out to Botswana. We would like to pay tribute to our colleague and friend, Kate Barlow, who died in November 2015. Kate’s work in developing and running the Bat Conservation Trust’s National Bat Monitoring Programme was instrumental to understanding the UK bat population trends and has influenced bat conservation projects around the world. Kate got hooked on bats as an undergraduate while on summer expeditions to South America, and went on to complete her PhD at Bristol University with Professor Gareth Jones, looking for ecological differences between the common and soprano pipistrelles. She got a bit sidetracked after that and went off to a bat-free zone, spending 4 years working for the British Antarctic Survey, but could not stay away from bats for too long! While working for BCT, Kate along with Kirsty (Head of our Board) came out to to lend a hand for some of the Botswana fieldwork. This lovely photo of Kate was taken at her very first elephant sighting. She will be sorely missed. ...is a botanist and keen photographer. He completed his MSc at the University of Stirling and volunteered in Botswana from November 2011 with Rebecca helping fieldwork. Tom had a hectic introduction to catching bats, with us catching hundreds of bats in our harp trap within half an hour. He did get the opportunity to see some lovely caves and lots of bats and is now a whizz at restringing harp traps! He enjoys travelling and since going to Botswana, travelled to Namibia, South Africa and Mongolia. ...completed her BSc (hons) at the University of Stirling shortly after volunteering on the 'cave-dwelling bat' project with Tom to help Rachael with fieldwork from November 2011. Prior to coming out to Africa Rebecca did a paid intership with Paul Lintott studying bats in an urban enviornment in the UK. After graduating she worked for the RSPB in Scotland but was bitten by the travelling bug too, and travelled to South Africa and Mongolia. ...is a super keen bat enthusiast! While Tina was doing her MSc in WildlifeConservation her thesis centred on ecomorphology of insectivorous bat communities in Swaziland. Tina has experience catching and handling a range of African species using mist nets, harp traps and manual capture. Tina has lived in Madagascar and Ghana and planned a trip to South Africa around helping Rachael in the field - a super keen volunteer indeed! Tina is currently living in Ghana but has recently been on a trip to Texas to see the famous Bracken cave (largest bat roost in the world). ...studied Animal and marine Biology at the University of Santiago de Composte (Spain). She has also completed a masters in Biodiversity and Environmental Conservation at the same University. Ledicia’s first contact with bats was in 2011, while working on a 6 months project “Bats in chestnut groves: an example of biodiversity associated to cultural woodlands” carried out by Drosera Association in Ancares and Courel (Galicia). She’s still collaborating with Drosera Association on bat research, conservation and education in Galicia. In October 2013 Ledicia started an internship at the University of Stirling, working with Rachael to analyse LOTS of African bat calls for her PhD. She's been an amazing help and is getting to grips with identifying African bat echolocation calls.